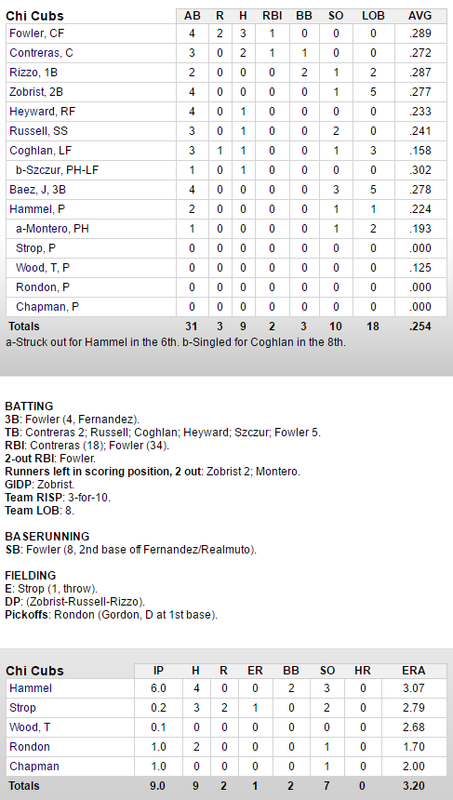 Once again Jason Hammel was brilliant in six innings of work for the Cubs as they held on to beat the Marlins 3-2. Hammel thought he could have went longer, which is usually the case as he only threw 80 pitches before being lifted for Miguel Montero in the bottom of the 6th (Montero failed). The strike zone was getting worn out by Hammel who finished the night throwing 52 strikes, and just 28 balls. Joe Maddon felt it necessary to pull Hammel in favor of Montero to try and capitalize on a scoring chance against Jose Fernandez, it didn’t work out. Pedro Strop was ineffective but his stuff was pretty darn good to this uneducated baseball watcher. Strop gave up two runs, only one of them was earned as he was charged with an error on a botched double play ball. It looked like there was a lack of communication between Zobrist and Russell on the play, shortly after that a ball ricocheted off of Strop and into right field for single to score the second run, just odd. Hector Rondon and Aroldis Chapman shut the door in the eighth and the ninth to secure the victory. Dexter Fowler was in the middle of it all as usual at the plate, he went 3-for-4 with a triple, an RBI, and two runs scored. Willson Contreras also had a stellar night against one of the best in Fernandez, he went 2-for-3 with a walk, and an RBI. The Cubs will go for the sweep tomorrow behind John Lackey, and the Cardinals lost so the NL Central lead swells to nine games. It might come as a surprise to you, especially if you checked out of the Cubs game early last night because like me, you had to get up for work in the morning. Well, I stuck it out to the end, and I’m tired, but I’m also glad that I got to see whatever that was last night. The Cubs trailed 6-0 early to the Mariners and for the first time in what seems like forever they came all the way back to notch their biggest win of 2016, so far. The game featured five different players playing left field, one of said players was a pitcher who also made a tremendous catch at the wall. 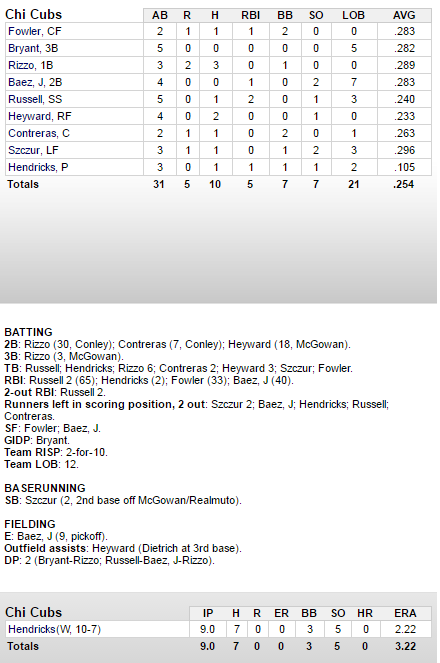 The Cubs tied the game in the ninth, scoring their third run of the inning on a wild pitch and walked off in the twelfth on a safety squeeze from Jon Lester, of course. Here is some of the video from last night, a huge win for the Cubs. We have no Major League baseball until Friday, so why not take a look back at an eventful first half while we wait. First up, Jake Arrieta dominates the Angels on Opening Night to start 2016 the right way. Eloy Jimenez owned the MLB Futures Game tonight, first he did it with the glove, then he eviscerated a baseball, and it was fun. Albert Almora Jr. has been in the big leagues for just about a week and a half, tonight he came up with the biggest hit of his career, a game winning double in the ninth.